Photo courtesy of Deep Blue Media. Rankings courtesy of FINA. 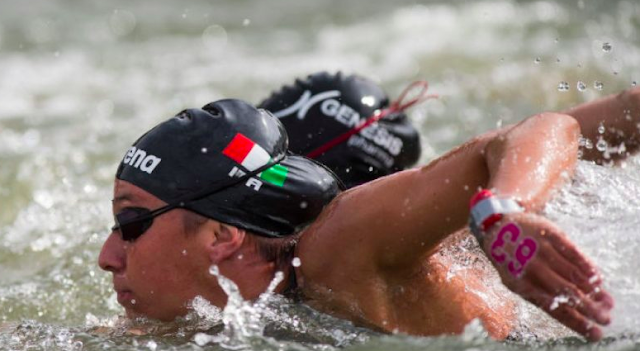 Arianna Bridi got to train with her world-class teammates on the Italian national open water team and that constant pressure and workouts helped her develop into this year's FINA 10K Marathon Swimming World Cup series champion. She won the first World Cup stage in Viedma, Argentina on February 4th and continued to perform well throughout the season. She finished third on the second World Cup stage in Abu Dhabi, United Arab Emirates on March 11th, won again on the third World Cup stage in Setubal, Portugal on June 24th and on the fourth World Cup stage in lac St-Jean, Canada on July 27th, finished third on the fifth World Cupstage in lac Mégantic, Canada on August 12th, finished second on the sixth World Cup stage on Qiandao Lake, China on October 14th, and won the seventh World Cup stage in Hong Kong on October 21st, culminating in her first career FINA World Cup title. Her Italian teammate, Simone Ruffini, also won the men's title for an Italian sweep of the FINA World Cup (the men's rankings are here).